I live a few blocks from the Foreign Trade Zone and about a mile to México, which means our landscape is often dotted by colorful semis. Everything is colorful down here in the Tropics even the trucks. But my look is everything but industrial. 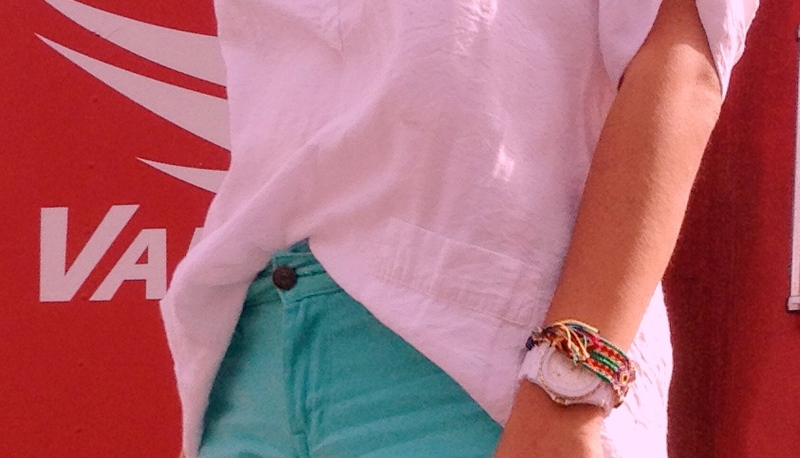 A flowing white shirt and mint colored shorts is my idea of comfort in the tropical heat. As a card carrying Californian of course I'm kicking it with a pair of Vans. Empty maquiladora parking lots are a great place to let the boys get their run on. Where are you running of to today? Love the outfit... looks awesome!! Ok, I love this. First I thought the shirt was pink (which would be equally pretty with soft turquoise shorts). The city where I live is quite colorful, too - some of the houses and storefronts (empty and occupied, both) downtown painted with skateboard graphics and tropical inspired brights. beautiful shots. love the colours! Follow your blog now and it would be great if you follow me back!